Israel’s Kiryat Yam vs. Google: Who’s responsible for Google Earth Community content? It’s been a year since a user-created placemark on Google Earth Community generated controversy for alleged bias by Google in matters Israel/Palestine, so I guess it is time to repeat history. What’s the current media frenzy about? Again, we have a layer uploaded to Google Earth Community ages ago (in December 2006); it purports to show Arab villages in Israel that were ethnically cleansed as a result of the war between Israel and several Arab countries soon after Israel’s declaration of statehood in 1948. The uploader is Thameen Darby, who runs the website Palestine Remembered, which seeks to document what Palestinians call Nakba, “the catastrophe”. Darby makes no secret of his views and allegiance to the Palestinian cause. What’s new this time? Israel on Blog was the first to hit my radar screen with the story, and sums it up well: City officials in Kiryat Yam, a small Israeli town north of Haifa, are suing Google for slander because a marker in Thameen Darby’s collection places the town of Arab Ghawarina — which Darby alleges was evacuated and destroyed in 1948 — at the location of present-day Kiryat Yam. The Associated Press quotes an Israeli historian supporting Kiryat Yam’s claim that there was no prior Arab settlement there. Darby’s Internet Web site pinpoints Ghawarina on the site of Kiryat Yam, but another places it south of Haifa at the site of a present-day Arab town, Jisr el-Zarka. This reporting raises some interesting questions. Did the town of Kiryat Yam make a good-faith effort to reach Darby to correct the location before deciding to sue Google, or is the town making a point of holding Google responsible for the content? Surely the historical location of a town is an easy matter for historians to be in agreement of, even in this region? If so, this whole tempest in a teacup could presumably be resolved quite easily. Is any of this Google’s responsibility? It’s not the first time that user-generated content has caused a government actor to get cross with Google. In 2006, a user posted the “secret” locations of Norwegian fighter jets to the Google Earth Community, prompting an army spokesman to threaten legal activity, though nothing came of it. While we recognize that some may find the user generated content objectionable, we are careful to balance the integrity of an open forum with the legal requirements of local governments. It looks as though this particular user-contributed annotation does not breach our Terms and Conditions nor is it in any way illegal. The Google Earth community layer is a place where people can tag their knowledge or opinions of a location. Their comments are clearly indicated with the ‘I’ icon and this layer can easily be switched on and off. We believe the majority of people use the community positively to share their expertise and experiences. In most cases, our users increase the utility of the product and provide a more meaningful and robust experience for each other with their contributions to the Google Earth community. 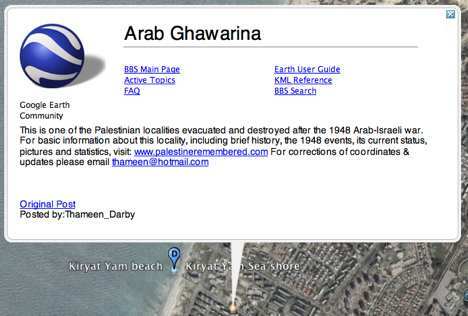 Reading between the lines, it appears that Google is willing to take a measure of legal responsibility for the contents of the Google Earth Community, but that it sees no evidence in this case that Thameen Darby’s possible mis-placement of the town Arab Ghawarina was intentional. In most democracies, a falsehood has to be intentional for accusations of slander to hold up in court. If this reading is correct, then Darby would have to change the location if it turns out he was wrong, or else Kiryat Yam could have a case in Israeli courts of law against Google, the publisher ultimately responsible for the layer. This is the problem with a big multinational running a community site such as Google Earth Community or YouTube, as opposed to just individuals posting to the commons that is the web. Governments and legal systems can and do make demands that web content they disapprove of be removed; but if I post something to my server in the US, I can ignore what Turkey or Thailand thinks of my views. If the publisher is Google, however, Google’s local business interests are assets that are liable to be targeted. Such tactics have already worked with YouTube: See Turkey and Thailand. There is nothing that keeps an Israeli court from collecting damages from Google in Israel if it decides that Google Earth Community violates Israeli law. What’s Google going to do, withdraw from Israel altogether? Unlikely. Does this mean that Google will police Google Earth Community in the future? That sounds unworkable. Instead, I’m guessing that such conflicts will be resolved in an ad hoc manner, depending on how much media upheaval is generated and whether there are concrete legal challenges that Google can’t ignore. Once again we are reminded of the importance people attach to the “public space” that is Google Earth, regarding it as a kind of de facto reference atlas for the world. If people are regarding it as “de facto reference atlas” and Google seems to not mind foster that mentality. Then shouldn’t the information displayed through Google’s product be as accurate as possible? Even the community driven portion. Or it’s OK to lie, lie about anything since no one wants to take respsoniblity for anything anymore. The community portion may not be Googles. But it is still reflection on Google. In the end it’s their product being used as a world atlas. What about Google Maps posting Jerusalem as the Capital of Israel. Shouldn’t palestinians sue google for that? There are two differences in that example. One is that the tagging of Jerusalem as the captial of Israel is Google’s doing, not a user. Two is that whether Jerusalem is the capital of Israel or not is not a question of ascertaining a “historical fact” but of choosing a convention and sticking to it: The convention is that each country gets to decide itself where its capital is, even if no other country recognizes it. This is the reason why most countries’ embassies are in Tel Aviv, not Jerusalem. In this case Dr. Darby is wrong, and it’s an error that could be avoided by doing some simple research. According to the British-sponsored PEF map from 1880, Arab Ghawarina is a region east of Acre populated with Arabs and there is no evidence of any population in the area marked by Darby. Unfortunately, Google does not accept posts for the Earth Browsing category to enable commenting, so basically they are not being impartial in this case and their response does not reflect reality. Israel has left it a bit late to cover-up its crimes and hide this information. 5 villages are designated “A” for “Abandonment on Arab orders” – and Haifa is 50% “abandonment”. But over 50 times more places (344) were ethnically cleansed by one or the other of these causes: C = “Influence of nearby town’s fall”, E = “Expulsion by Jewish Forces”, F = “Fear (of being caught up in fighting)”, M = “Military assault on settlement” or W = “Whispering campaign – psychological warfare by Haganah/IDF”. Reason “M” appears to account for at least half the villages, though often with “F” or “C” as well. So 98.5% of the Arab places known were ethnically cleansed. (There are another 38 “unknown”, but they’re not going to affect anything). Basically, the denialists are not going to stop this unpleasant behaviour until we confront them with their shocking history. Can you believe it – they’re blustering and actually trying to insist that Dayan, their top military hero, intended to say that the villages he named were bought and paid for! of course, Andy ignores Morris’ fundamental point that were it not for the Arabs’rejection of partition and launching hostilies with cries of “itbach el-Yahud” (“Kill the Jews”) then none of the aftermath (both Arab and Jewish refugee populations) would have resulted. I just happened to zoom over to Israel and noticed the Palestinian markers all over the map. Politics aside, why am I not seeing ANY markers at all for any cities, boundaries, roads, natural sites, etc. in Israel? Also if Google wants to retain objectivity of disputed lands then please remove Texas, New Mexico, Arizona, and California from the US map as we “stole” those territories in war. Also get ready to redraw Ireland, Scotland and a lot of boundaries in Europe. The US has sovereignty over Texas and California. There is no UN resultion declaring their annexation illegal and the last time I checked the hispanics living there have the benefit of US citizenship and are not restricted in the parts of texas they can and cannot enter. This is not the case in the west bank. Politics aside, you can see the settlements from space theyre so huge. Actually Im quite embarassed by my posting, it is amateurish, out of date already and leaves out many settlements, unauthorized outposts, settler only roads, closed military zones, etc. This is using Israeli sources and shows planned expansion far beyond my limited post. In terms of the challenge to Thameen’s post, well that’s effectively admitting that the other 99% of it is correct isnt it? Quite a compliment.